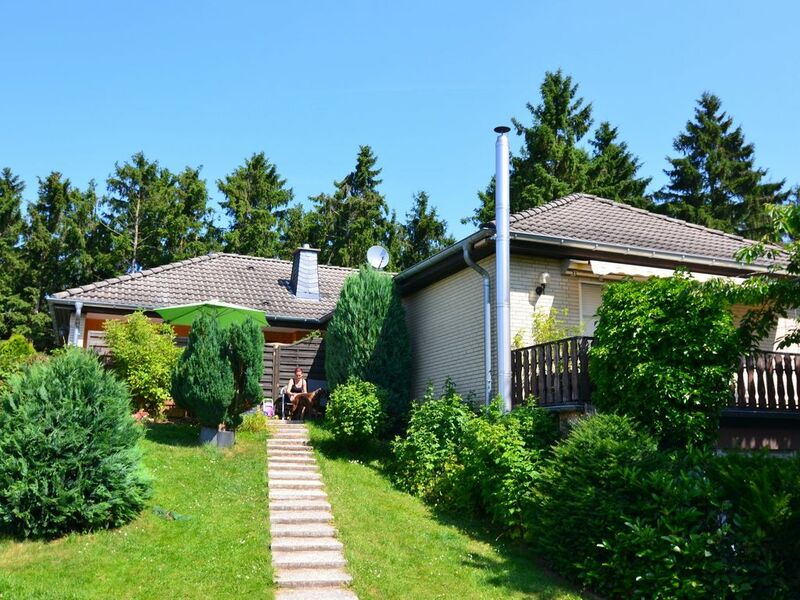 This accommodation is located in a quiet forest location in Heringhausen, overlooking the lake and mountains. The house has a separate entrance, is connected to the main building and is cosily and tastefully furnished. Spend a wonderful holiday with you and your family. The lake is 5 minutes away on foot. There's a horse farm nearby, where you and your children can also ride on horseback through the forests in the area. Boat and canoe rentals, a great swimming pool (hot spring), surfing, fishing, boat rides, mini-golf, children's playground and attractive dining facilities can be found right in the village. In winter, cross-country trails are available and the toboggan run is right next door. If you're looking for even more fun, the large tourist resort of Willingen, known for its World Cup ski jumping, is just a few minutes away by car. Ferienhaus Diemelsee is truly a beautiful home. Quietly situated at the beginning of a cul-de-sac. The house is divided into three apartments. This apartment from the kitchen and overlooking the Diemelsee from the terrace. The modern kitchen is more than well equipped with a dishwasher, oven, microwave and dishes. The spacious bathroom has been renovated in 2013 with a 2nd toilet, double sink and nice shower. In the living room a modern sofa and 2 single chairs with a good seat. The fireplace is easy to operate, protected by a glass door and prolonged ensures a pleasant temperature. The bedrooms are equipped with proper 1-beds and spacious closets. We did not miss anything in the interior. If min \\ / focus point I want to mention that in the hall and other bedroom you smoke clear that there are dogs stay. Especially for dog lovers this holiday highly recommended. The owners who live next to it and are very friendly and helpful. The house is like us just fine. Plenty of space in terms of living room / bedroom / kitchen and dining area. Shower / bath (above) and WC 's fine. We were 11 people including 4 children. When we were there, there was just installed a new kitchen. All equipment did and worked top. Complete terms of service and any bestek.Het what we missed in the kitchen is a 2nd outlet. There's only one. Was clumsy set with coffee and tea. When looking for a 2nd socket for the kettle it was just searching. Wie oben angegeben. Hier kann man einen optimalen Urlaub verbringen. Prachtig uitzicht en goede indeling woning. Veel pluspunten. Een minpunt zijn de bedden. Deze zijn in redelijke staat maar niet comfortabel. Ook rekening houden met extra kosten zoals elektriciteit en wifi. Verder super huisje en vriendelijke eigenaar. Het huis was ruim voor ons drieën. Alles was aanwezig, mooi compleet. Fijn terras met mooi uitzicht. Voor 's morgens kon je verse broodjes bestellen. Voor de supermarkt moest je wel even rijden.